Artipelag, an international venue for high-quality art, events, and food, is one of Stockholm’s largest art galleries. The final creation of Johan Nyrén, this 32,000-square-foot property is intended to make guests feel as though they are indoors and outdoors at the same time. Thoughtfully designed with the incredible landscape in mind, the museum truly creates harmony with its surroundings and has much to offer to those who are interested in the alliance of art and nature. 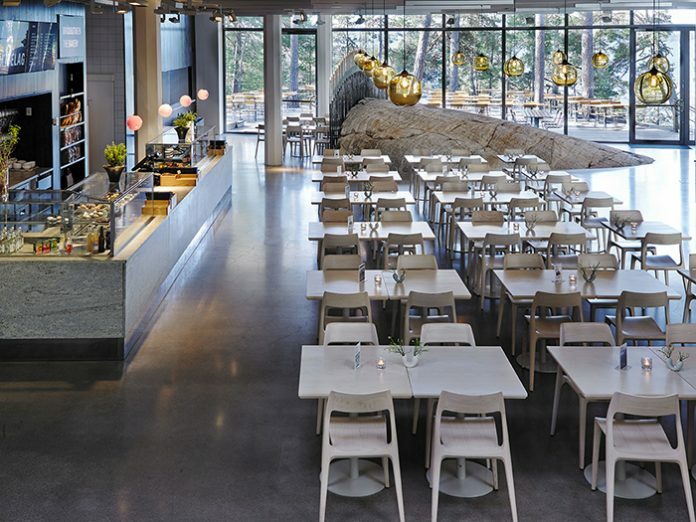 Named after the massive, two-billion-year-old rock erupting through the floor, the Bådan Buffet & Cafe offers museum-goers delicious lunches and freshly baked treats. In this room, handmade Solitaire pendants from Niche hang above custom-made furniture. The Edison bulb at the centre of the signature Solitaire pendant and the cylindrical shape of the glass body harmonise to create enduring quality and beauty. The honey-colored hue of their Amber glass complements the light wood tones and creates a warm, inviting atmosphere for both visiting tourists and locals. Situated above Baggensfjärden bay, the Artipelag Restaurant can be found two floors up from the Bådan Buffet & Cafe. Here, Solitaire pendants in Crystal glass hang above guests in the dining room. This minimalist silhouette provides the perfect accent lighting in a space where natural light shines through large panoramic windows. The wood interior beautifully mimics the elements found just beyond the restaurant, showcasing another way in which the designer’s vision was fully realised.